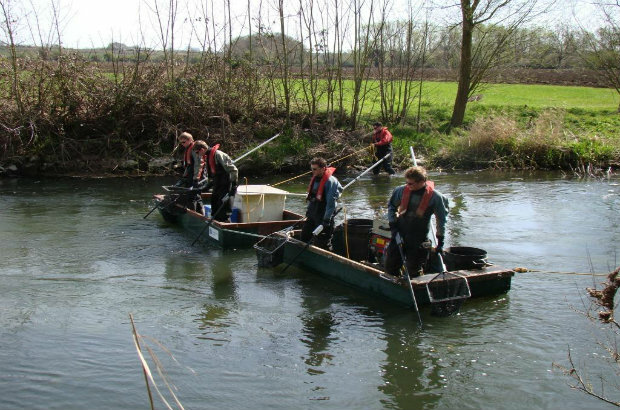 The Sampling and Collection teams have an important role to play for the Environment Agency to help understand and enhance our water wildlife, but what does the work involve? The sampling and collecting teams (S&C) primary function in fisheries is to provide raw data on fish populations in our rivers. This data is essential in classifying rivers and water bodies under the Water Framework Directive (WFD). We carry out fish population surveys predominately using two techniques: electric fishing and netting. We record the numbers of fish caught, their species and individual lengths, and we remove a couple of scales from a range of fish amongst key species in order to assess growth rates. Rivers are monitored on a six-yearly basis, enabling us to monitor any changes in populations whilst giving us time to monitor all the major waterways in the Great Ouse catchment. In our area - Cambridgeshire and Bedfordshire - we have a range of fisheries from small streams and fast flowing rivers, through to huge deep drains spread across the fens. The variety of waterways is also reflected in the species we find from the rarer river lamprey and spined loach, right though to the commonly found roach and perch. As a result we have surveys specifically designed to monitor coarse fish, eels and salmonids. Occasionally we may monitor rivers on a more frequent basis. The Ouse Washes in Cambridgeshire and Norfolk for example are currently being monitored every three years. This is as a result of regular water quality issues on the channels caused by summer flooding of the washes. Oxygen levels as low as 5% are not uncommon during particularly bad spells, which obviously put a huge strain on the fish populations inhabiting both the River Delph and the Counterdrain between Sutton and Downham Market. We are also carrying out some investigation monitoring on the River Tove on the upper Ouse near Towcester this year. The local angling club highlighted concerns over declining fish stocks which when we looked back over historic data was confirmed. Although results from the last survey were not terrible, an obvious decline could be witnessed, and it was decided that because the Tove was not due to be surveyed for another three years, we would carry out some additional monitoring. This enables us to understand current stocks and gain a more detailed data set. Other survey work that we carry out includes monitoring of fish passes that have been installed and habitat improvements that we've made in order to assess their efficiency and effectiveness. We also undertake surveys where we look to catch brood stock for our Environment Agency fish farm in Nottingham. The fish are bred from and then returned along with a huge number of fry from the brood stock. In the winter, we occasionally carry out 'cropping jobs' on stillwaters which have too higher densities of small silver fish. We capture and move these fish to club waters which will benefit from the introduction of fish. Ultimately the survey work we do is essential for understanding the health of our rivers - the presence of a broad range of fish and high fish populations is a good indicator of the quality of the water and habitats in that channel. Excellent blog shared for surveying the fishes in river & knowing the presence of a broad range of fish and high fish populations.